Pebble Trax™ Grande™ is a full ONE-INCH thick providing the ultimate in comfort and ergonomic support in the harshest dry environments such as assembly lines, lab areas, machine workstations, and packaging areas. The pebble-embossed rubber top provides non-directional traction, is easy to clean, and resists exposure to sparks from welding. The resilient SBR rubber top surface is combined with a dense closed cell foam base utilizing NoTrax exclusive UniFusion™ technology virtually eliminating the possibility of de-lamination. Includes a three-year warranty against manufacturer's defects. Pebble-embossed top surface of resilient SBR rubber is combined with dense closed cell foam base utilizing NoTrax exclusive UniFusion technology. Now with RedStop™, a uniquely engineered technology that eliminates the slipping and sliding of NoTrax floor mats on all types of smooth floor surfaces such as vinyl composite tile, painted or epoxy coated concrete, vinyl sheet flooring, carpet, and ceramic tile. - Overall Thickness – 1"
- One of the 4 most comfortable mats available for dry area applications. - UniFusion bond guaranteed for the life of the mat – See warranty for details. 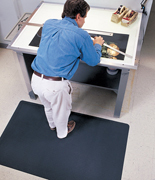 - Sloped beveled foam on all 4 undersides affords easy access onto and off of mat. - Manufacturer’s warranty of 3 years is provided. - Recommended for dry areas. - Now with RedStop to eliminate mat slippage. Sales Tip: Rubber top resists exposure to sparks from welding. Easy to clean non-directional top surface. Ideal for multi-shift environments. Location: Where work cells are subjected to extreme traffic.